An if statement allows you to choose between two discrete options, TRUE or FALSE. When there are more than two options, you can use multiple if statements, or you can use the switch statement. Switch allows you to choose between several discrete options. This tutorial shows you how to use switch to turn on one of several different LEDs based on a byte of data received serially. The sketch listens for serial input, and turns on a different LED for the characters a, b, c, d, or e.
Five LEDs are attached to digital pins 2, 3, 4, 5, and 6 in series through 220 ohm resistors. 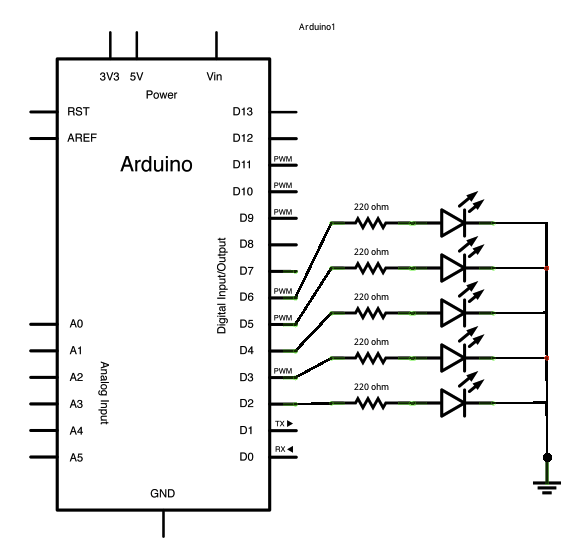 To make this sketch work, your board must be connected to your computer. 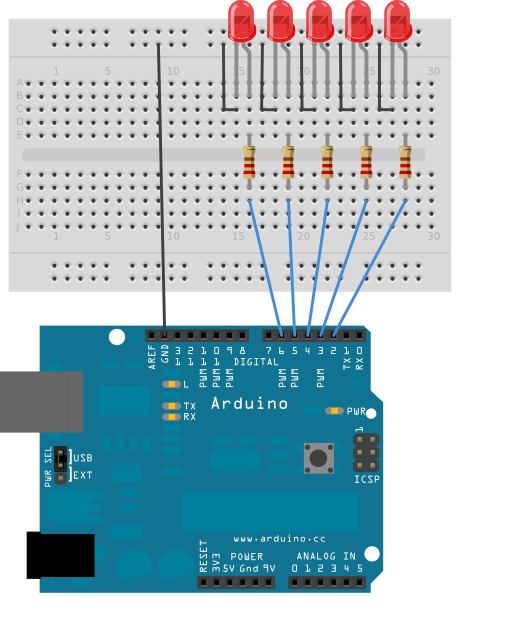 In the Arduino IDE open the serial monitor and send the characters a, b, c, d, or e to lit up the corresponding LED, or anything else to switch them off. To see this sketch in action, open the Serial monitor and send any character. // do something different depending on the character received. Arrays - A variation on the For Loop example that demonstrates how to use an array. ForLoopIteration - Control multiple LEDs with a for loop. IfStatementConditional - Use an ‘if statement’ to change the output conditions based on changing the input conditions. switchCase - How to choose between a discrete number of values. WhileStatementConditional - How to use a while loop to calibrate a sensor while a button is being read.